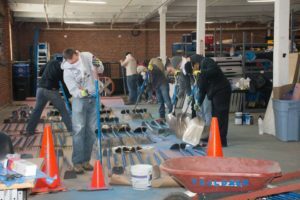 The Baltimore Community ToolBank thrives on volunteerism. As a small staff, we welcome volunteers to join us in serving our partners. In any given year, 750 – 1,000 unique volunteers help perform all manner of tasks. From inventory maintenance and organization, warehouse efficiency projects, environmental work in our stormwater factory, rain gardens and building floating wetlands, we are stronger when others join us! We welcome individuals, repeat volunteers as well as one-time group projects. To learn more about individual volunteering, click here. To learn more about volunteering as part of a business or higher education group, click here.